Industry stakeholders are urgently calling on retailers to switch back to using recycled plastic packaging, as the market is currently experiencing ‘unprecedented challenges’. Resource Minister Dan Rogerson held a meeting with major stakeholders in the plastics recycling supply chain at his office at the Department for Environment, Food & Rural Affairs (Defra) on Tuesday (18 March), to discuss the need for continued commitment to recycled plastic packaging in the face of challenges facing the plastics reprocessing industry as a result of falling oil prices. As such, Rogerson called the meeting on Tuesday to discuss the market challenges and voice his support for recycled plastic packaging. At the meeting, which included representatives of the packaging, dairy, resource management and reprocessing industries, stakeholders also committed to improve their recycling rates further under the voluntary Courtauld Commitment and the Dairy Roadmap, which commits dairy farmers to increase the recycled content in plastic milk bottles. Rogerson commented: “The plastic packaging supply chain has worked very hard to increase the amount of packaging being recycled, with the full support of government. “I welcome commitment from across the supply chain to deliver on the existing agreement. This week’s meeting makes clear our commitment to go even further, continuing to embrace new technology to make sure more recycled plastic is used throughout the supply chain. 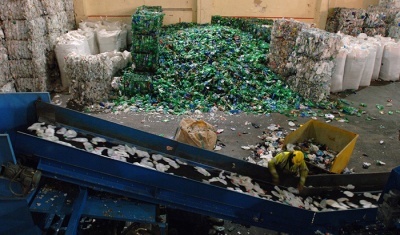 Members of the waste and resources industry have welcomed Rogerson’s support, but have urgently called for retailers to ‘switch back’ to using recycled plastic to help protect the ‘vital UK recycling infrastructure’. However, he warned: “The meeting heard many general messages of support for the continued use of recycled content in line with the commitments made under the Dairy Roadmap and Courtauld Commitment, facilitated by WRAP. However, these were not backed by specifics in the meeting and, frankly, warm words are not enough. Georgeson added that while there are “cost pressures” on all parts of the supply chain, reprocessors are “carrying the cost burden and most of the risk”. As such, he said a long-term view is needed, and “a reminder of the sustainability commitments made by retailers and major brand owners is now necessary, along with this urgent appeal to take the long view, stand firm with the reprocessors, help them weather the storm and protect this vital UK recycling infrastructure for many years to come”. Chair of the Resource Association Peter Clayson added that the body is “ready to assist the minister and industry in any further discussion that may be needed to accelerate this week’s important intervention by him to a level where urgent and positive decisions can be made by those who have them in their gift”. “However, now is the time when action really counts as the plastics markets experience unprecedented challenges. Ultimately, the imperative goes beyond simply meeting targets and legal obligations, it is about ‘tooling up’ to ensure that the UK directly reaps the environmental and economic benefits of recycling and resource efficiency. Members of the food and drink industries, as well as packaging bodies, have supported the calls for more commitment, with Andrew Opie, Director of Food and Sustainability at the British Retail Consortium (BRC), saying: “We are aware of difficulties in the plastics recycling industry and are supportive of the principles of recycled content in packaging and products. Dr Judith Bryans, CEO of Dairy UK, added: “Under the Dairy Roadmap, dairy companies have worked hard to achieve the target of 30 per cent recycled material in HDPE milk bottles by 2015. There will be further progress in the future. Find out more about the problems facing the plastics industry or learn more about the Courtauld Commitment and Dairy Roadmap.